The average person makes 35,000 decisions a day. If we eliminate as many of these decisions as possible, we have more energy and wisdom to make the ones that really matter. Today’s topic will set the ground work for the rest of our series on self-care. If we can understand what decision fatigue is and see it in our lives, we can eliminate it and make every other area of home-care flow more easily. Studies claim we repeat about 40% of our behavior almost daily. You probably eat lunch at the same time each day. You sit in the same seats at church each Sunday. You order the same thing at your favorite restaurant. I even text my best friend at the same times each day (9:00ish am and 9:00ish pm to see what she had planned for the day and then see how it went). 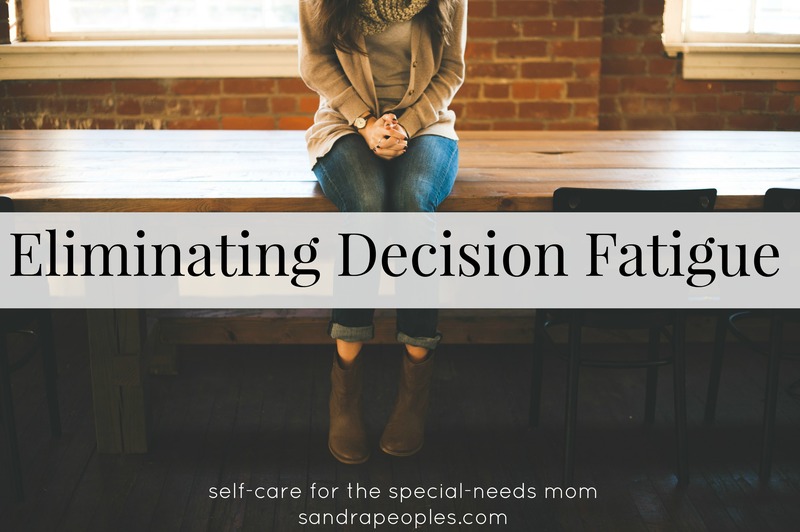 Fatigue can set in when we make too many decisions. They start when you wake up. Hit the snooze button or not? Pretend to still be asleep so your husband gets up first? Grab your phone or go to the bathroom first? To eliminate fatigue, make the best decision and then repeat it each day. I don’t hit snooze. I check my phone while my husband is in the bathroom. I get up and make James’s lunch (cheese quesadilla, fruit serving, vegetable serving, crackers). That’s the first thirty minutes of my day, Monday through Friday. It takes no mental energy because it’s the same each day. Then I have plenty of energy for the first big decisions I make each morning (which is reading the newest post on Not Alone and linking it up to our social media channels). Keep a journal of all the decisions you make each day and try to eliminate as many of them as you can (we’ll work on this in the next week as we talk about menu planning, a cleaning routine, and minimalist living).